We hope you'll enjoy this interview with author Jim Donovan about his new book Happy at Work: 60 Simple Ways to Stay Engaged and Be Successful. We also invite you to subscribe to New World Library's YouTube Channel for immediate access to the latest author interviews, book trailers, and more. Ralph Metzner, in his book Green Psychology: Transforming Our Relationship to the Earth, discovered that tuning in to each of the four elements of nature — air, earth, fire, water — produces an experience of consciousness that is associated with the qualities of that element. He didn’t exactly have writers in mind when he put forth this idea, but, since I’m a writer, that’s how I translated his work, and I think it’s a valuable tool for writers. When we align ourselves with the element of nature that meets our writing needs, we dip into a vast inventory of inspiration and insight. 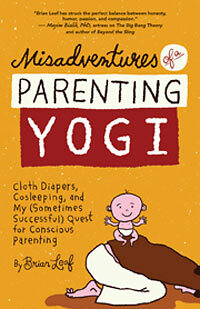 We hope you'll enjoy this lovely book trailer for Misadventures of a Parenting Yogi by Brian Leaf. We also invite you to subscribe to New World Library's YouTube Channel for immediate access to the latest author interviews, book trailers, and more. When my boys were two and five, I felt ninety-seven years old. I was short on sleep and always overwhelmed. For a few years, my wife, Gwen, and I sat on different couches in the evening and mostly snapped at each other when we did speak. I wondered if there was a better way.